I know Rosco seems like an odd figure to be the first of a line to review on TVFT. He’s not one of the heroes, and probably not the best in the line. Well, there’s no probably, he’s not the best in the line. For those that don’t know, Sheriff Rosco P. Coltrane was the guy responsible for trying to catch them Duke boys every week on the “Dukes of Hazzard” on TV. Well, this is where it all starts to go down hill. I have no idea who this is, but it doesn’t look like James Best, the actor that portrayed Rosco. Rosco’s actual face is quite a bit less round that this one. Also, while the hair is a fair approximation of the hapless sheriff’s, it’s the wrong color. During the run of the series Rosco’s hair was black to a salt and pepper mix. I can find no evidence of it ever being reddish grey. Now from pictures you can probably tell that Rosco here is a bit oddly proportioned. 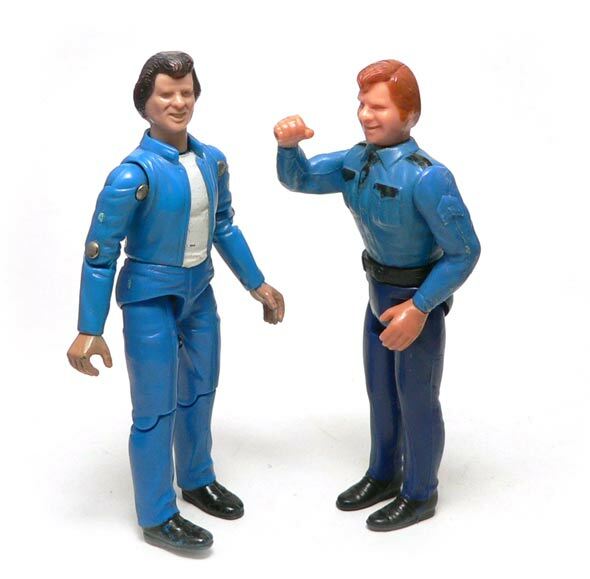 This is the result of quite a bit of Yankee ingenuity on Mego’s part back in the early ’80’s when this figure was released. The legs of this figure appear to be taken from the Mego Star Trek: The Motion Picture Line. I believe all of the male human characters from the film shared these legs. The police like shoes are just a bit of a paint illusion. I’m guessing the waist/belt and pelvis piece are from the Pocket Super Hero line. I strongly suspect this is Robin’s belt, but I don’t have one to compare it to. I also think the pelvis is from one of the 70’s bent leg heroes. At least I’m hoping that is the explanation of the odd shape of it. 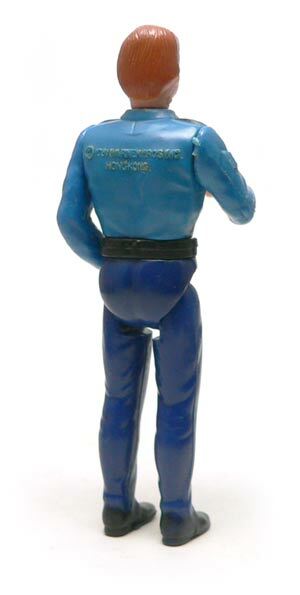 The torso and arms are from the Mego CB McHaul line that came from the trucking craze of the late Seventies. TV Rosco was fairly thing and not ripped. This figure would have us believe this guy had huge shoulders. The torso also has the tie tucked in, a look which I don’t believe the real Coltrane ever used. Same with the chevrons on the arms, the police on the show had more standard county logos on their shoulders instead of rank insignia. Fun? I’m not sure. Past being a requisite police car driver to chase the superior articulated Duke boys, he’s a bit boring. The hands do rotate, but my figure’s wrists are feeling a bit fragile. Rosco also came with a trooper style hat, but mine has been lost to the ravages of time and storage. What can I say? This isn’t a great figure. It’s one of those characters that has to be included in a line, but this effort is basically a place filler. I think it’s interesting though, that while mold reuse seems to be a more modern trend, this guy was a trend setter from the early ’80s. 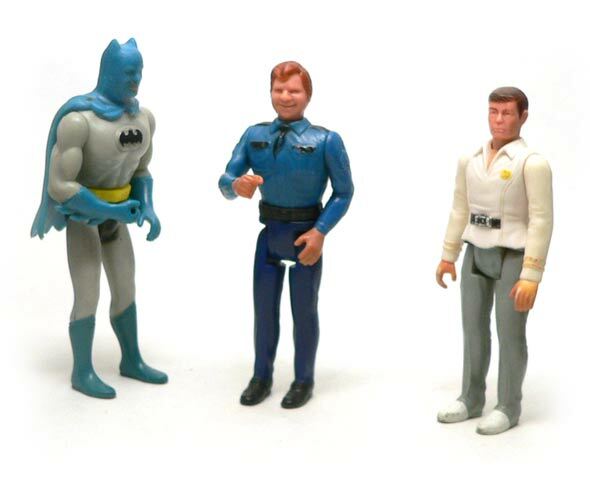 Basically a kit bashed figure rushed to production to allow Mego to dabble in the 3 3/4″ figure craze, Rosco just can’t get any respect. That’s an interesting figure. Odd how the figure design differs from that other DoH figure in the pic, although both head portraits are definitely from the same sculptor. Luke Duke is actually a repaint of a Black Hole figure with a different head.